The total number of superyachts over 24m sold in January now reaches 12 as Eric Trupheme at Ocean Independence tells me that his joint central agency with Sanlorenzo, the 27.71m motor yacht Lammouche, has been sold to a Sanlorenzo client. Lammouche was built by Sunseeker in 2007 and is tastefully appointed with a satin American black walnut interior and a contemporary mix of of fine fabrics and fittings. She accommodates 10 guests in two doubles and two twins plus two Pullman berths and is MCA compliant. Technical features include a pair of 1,822hp MTU engines, full Trac digital zero speed stabilisers, custom tenders and a bimini top. 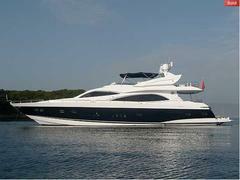 This superyacht was asking €2.8 million.